199 DolfansNYC members piled into MetLife Stadium on Oct. 28, 2012 and cheered, chanted and sang the team’s fight song as the Dolphins cruised to a 30-9 victory over the Jets. The group’s spirited celebration was not only heard by dejected home fans throughout the stadium and clearly audible during the television broadcast, but left a lasting impression on Dolphins players. “Oh, yeah!” said Miami punter Brandon Fields with a smile when I asked him about hearing Dolphins fans in the stands at N.J.
Fields grew even more excited when I told him that he and his teammates would hear over 550 DolfansNYC fans on Dec. 1 – a record for largest fan group to ever invade MetLife, and a number that has since grown to a staggering 760. Come Sunday, Jets players and fans alike won’t know what hit them. 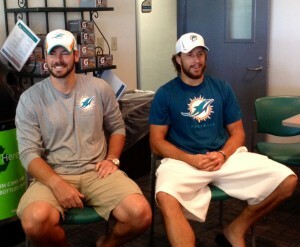 For the last ten years the Miami Dolphins have invited a group of Miami Dolphins fans who run websites down to Miami. I am one of four people who have been to all ten of them. I used to run another Dolphins website that no one ever read but somehow the Dolphins found me. We would go down every year and I just would update my site enough to keep getting invited. Around year four I met the 2 Michelle’s, two girls from NYC who had a Dolphins blog. I started watching games with them and after Tall Michelle moved Short Michelle and I founded DolfansNYC. Last year was a really big one for us. We donated a ton of money to the Miami Dolphins foundation and ended up winning a “Webby Award’ for best community website. We also used the opportunity to reach out to other Dolphins fan sites and raise even more money for hurricane Sandy relief efforts. It was a pretty amazing trip. This year was even better for us. We won the community webby again and we ended up raising $3000 already this year that we donated to the Miami Dolphins Foundation. We also donated another $300 to two Dolphins Cycling Challenge riders who are doing a bike ride to raise money for the Sylvester Cancer Center at the University of Miami. We gave Joe Philbin, Sam Madison and OJ McDuffie DolfansNYC shirts and OJ told us he might wear it to our #MetLifeTakeover event on December 1st! He posted a photo of himself wearing it on Twitter too! We also got to meet Brandon Fields and John Denny who signed some stuff for us to raffle off and we also had John Offerdahl sign some stuff too. He spoke to us and promoted his Gridiron Grill Off which you should check out if you are in South Florida. That guy is always hilarious but he had just come from a food and wine festival and had a few drinks in him and he was so so funny. All of us were dying. That guy is a legend. The highlight of the trip for us was when we presented new CEO Tom Garfinkel our Miami Dolphins Foundation donation. He seemed genuinely moved and invited us to his suite to watch the game. We were honored and got to watch the game at the 45 yard line with free food and 2 Live Crew’s Luther Campbell sitting a few feet from us. We talked to a bunch of the Dolphins marketing staff and they had told us that they were big fans of what we were doing in NYC and we had come up in meetings. We spoke to Mr. Garfinkel a little more in detail about what we were doing as well. The whole thing was pretty amazing. In the end the game turned out very poorly and sadly we left Miami with a bitter tastes in our mouths but looking back in a few years we won’t remember this one loss to the Bills, but we will remember the experience and how we took another step towards taking NYC back from the Jets fans! DolfansNYC over everything! Hope to see you guys tomorrow at Slattery’s Midtown Pub to watch the Patriots game. 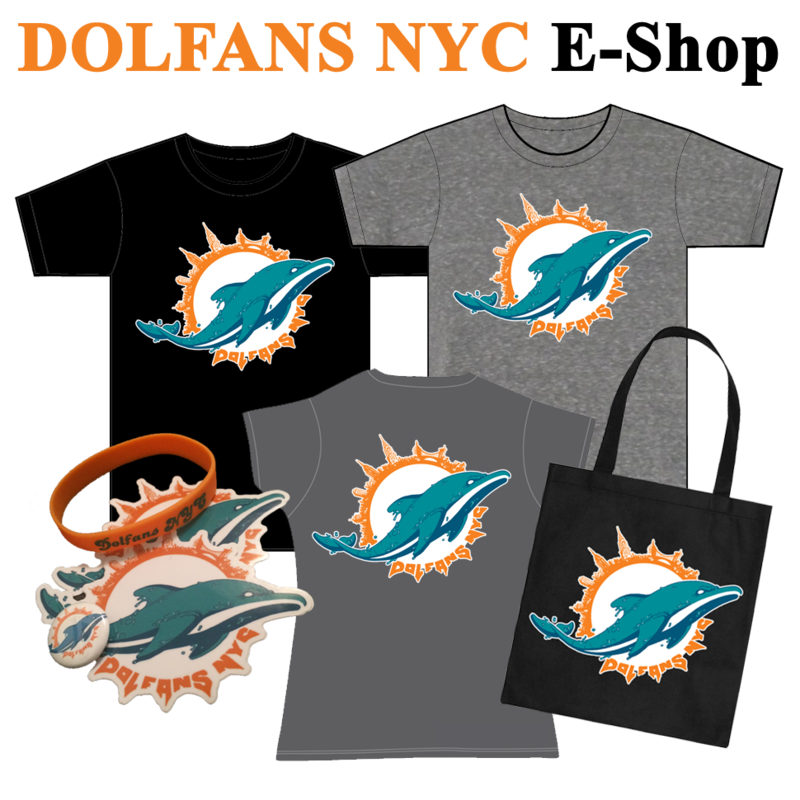 Win or lose we will have a ton of fun and we will have new DolfansNYC hats for sale! Phins up! Check out our photos from Web Weekend X below!